ST. GEORGE — A triple-unit UPS semitrailer toppled its third trailer on Interstate 15 southbound at about milepost 14 in the Virgin River Gorge Tuesday, causing temporary traffic delays in both directions. The trailer toppled shortly after traffic breaks made to accommodate bridge girder deliveries for an ongoing bridge rehabilitation project were completed. 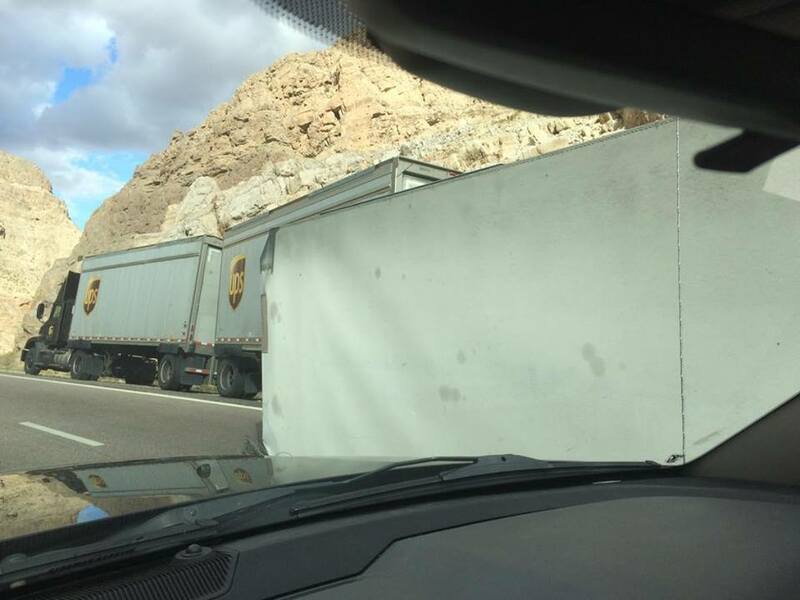 The UPS driver told Arizona Highway Patrol troopers that the brakes on his rear trailer locked up, Arizona Department of Public Safety Sgt. John T. Bottoms said. 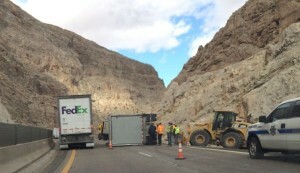 The driver kept driving, Bottoms said, and got his truck pulled off to the right side of the road as far as he could but the toppled trailer remained blocking the southbound right lane. The glare screen knocked off by the trailer blocked the northbound left lane, causing temporary lane closure there as well while that was cleared. Wadsworth Brothers Construction out of Draper and Pulice Construction Inc. out of Phoenix, Arizona, partnering to rebuild Bridge No. 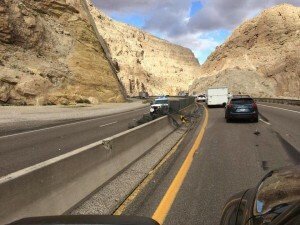 6 as part of Arizona Department of Transportation’s bridge rehabilitation project on I-15 through the Gorge, gave assist that, Bottoms said, considerably reduced the traffic impacts. 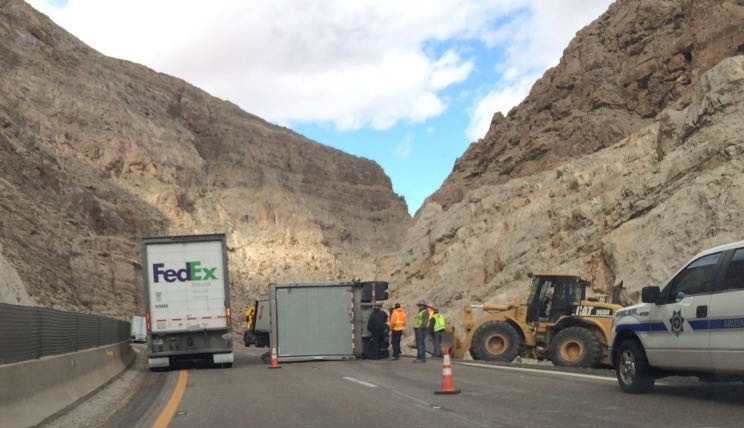 The construction crews brought front loader, wire snips and bolt cutters to remove the glare screen quickly, Bottoms said, allowing the reopening of the northbound left lane even before a tow truck company could arrive to upright the trailer on the southbound side. At about 11: 20 a.m., Bottoms said the semitractor and its trailers are off to the right of the Interstate. Though they have yet to be removed from the scene, they are no longer blocking traffic, which is flowing smoothly. 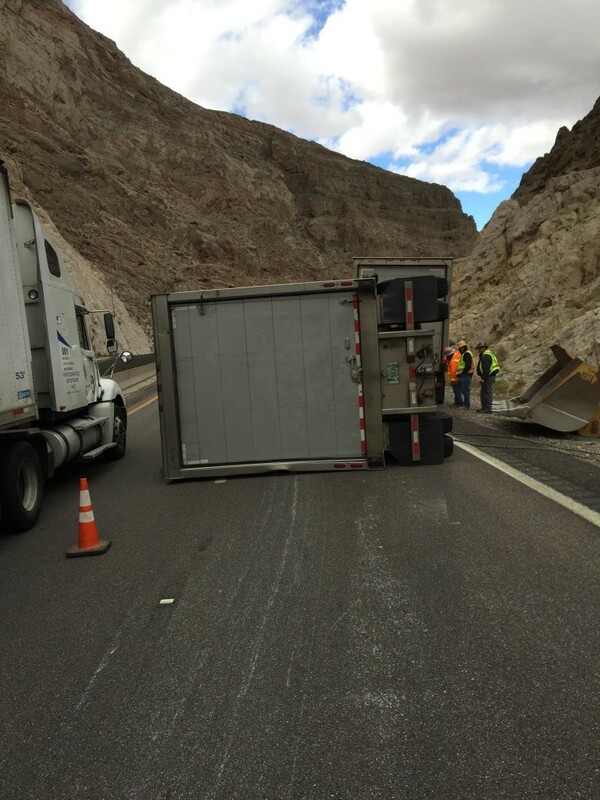 The commercial vehicle and commercial vehicle driver are being inspected by troopers with Arizona DPS’s Highway Patrol Division, Bottoms said, to be sure there weren’t any other issues that may have contributed to the incident. About 20 minutes before the UPS semitrailer accident, the AHP division conducted traffic breaks for the delivery of two more new bridge girders, Bottoms said. These add to two delivered for the Bridge No. 6 rehabilitation Monday. The girders delivered Monday and Tuesday are longer than 100 feet and thus required traffic breaks for both escorting the deliveries and unloading the girders. There are 20 more girders to be delivered to the site of Bridge No. 6 over the next week and a half, Bottoms said, at a rate of about four per day. Those girders, however, run at most 90 feet, he said, and won’t require traffic breaks for escorts – only for unloading. Traffic impacts will be shorter than those caused by Monday and Tuesday’s deliveries. Bridges in the Virgin River Gorge were originally constructed in the 1970s. When this section of highway was built, it was the most expensive rural interstate highway built, per mile, and was completed in 1973 after a decade of construction. ADOT began work in January 2014 to modernize and rehabilitate bridges through the Gorge. Work on three of the bridges has been completed, specifically surfaces for Virgin River Bridge No. 2 at milepost 13, Bridge No. 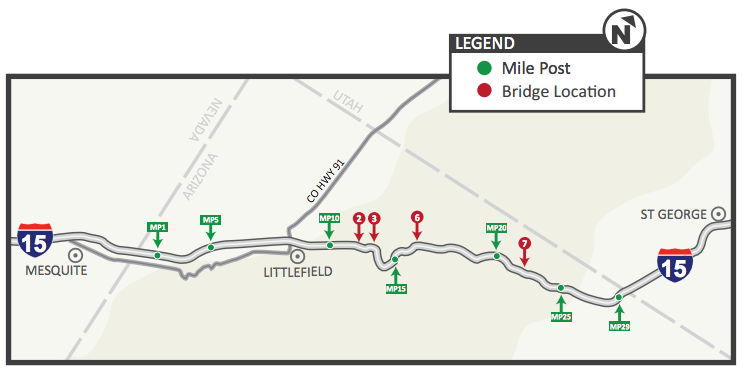 3 at milepost 15 and Bridge No. 7 at milepost 22. Work began on Bridge No. 6 in the spring of 2014 and is now anticipated to be completed in the spring of 2016. Bridge No. 6 involves a $27 million rehabilitation project replacing the bridge’s superstructure – girders, deck and railings – as well as widening the roadway through the narrow passage of the gorge. WHY did they run this highway through the gorge? If they had upgraded “old US-91”, we wouldn’t be having these problems. 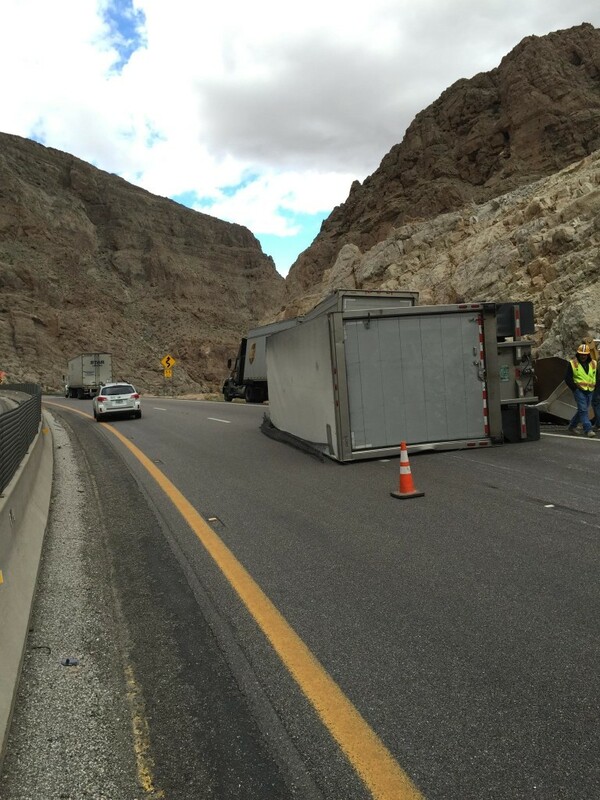 Wow, I had no idea that old US-91 was immune to trailer brakes locking up and semi’s tipping over. Could you explain the science behind that? Do you propose running I-15 through Veyo and Gunlock, or Santa Clara? While the gorge was a challenging and expensive project, most of the problems they have there are unrelated to the geography. People just drive too fast for the conditions, but that is true on US-91 as well. Having lots of people drive drunk back from Mesquite doesn’t help, either, and would affect either road. 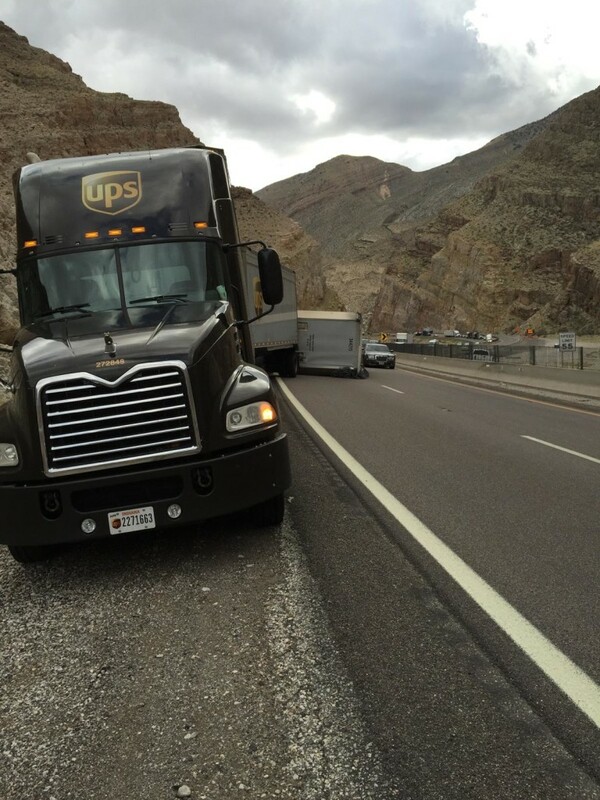 And steep grades like on US-91 come with their own challenges (including brakes failing, ironically). Take a chill pill Brian . Talk about acting like a jerk.! I still can’t believe those triple trailers are legal, they look unsafe on a straight stretch of road. What scumbag special interest group pushed that one through? Our airport really should have been built to handle bigger planes and more deliveries via air. Between my husband’s work and just everyday items I get multiple UPS deliveries almost everyday as well as most of my neighbors and the truck rarely comes before 7pm, during December the truck doesn’t come till after 10pm. UPS is overwhelmed in my area. 2 years ago at Christmas UPS was so backed up my 2-day amazon packages sat for a week at the distribution center. On Christmas eve they let us in to search for our packages. There were 1,000 of packages backlogged. If this city won’t approve business to shop locally at then we need to make it easier to get UPS/FedEx packages to residents. It isn’t just shopping but I have to get one medication via UPS because no pharmacy can get it locally and I know plenty of seniors in this situation. There are business that have to get parts and supplies shipped in. Have you ever watched the UPS tracking on air packages to St George? Almost all go through SLC and are driven down delaying them. I would say I get a shipping refund 50% of the time because UPS and fedex just can’t find ways to get packages to St George on time. Getting your stuff on time is going to cost ya. Those drivers are pushed to get those deliveries to their final. FedEx and UPS are notorious for being in the middle of a wreck. They hook and unhook from so many of those trailers in a day where the pace is frantic and probably more than a few pre-trips are missed to catch any issues. They might preach safety in the office but if you’re doing your job right, you’re holding up everybody. Get it there on time or die trying.